The Opportunity Zones program, created in the federal Tax Cuts and Jobs Act of 2017, is a new tool that provides tax incentives for investments in low-income communities all across the country. 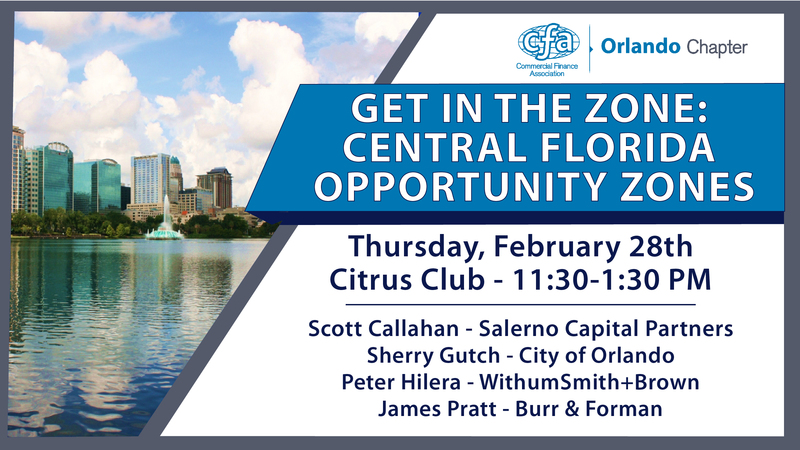 CFA Orlando invites you to join our panel of experts as they discuss everything you need to know about this new law and how to capitalize on it in Central Florida. Sherry Gutch has served as the Business Development Division Manager since her appointment by Mayor Buddy Dyer in 2017. As the Business Development Division Manager, Sherry’s team is responsible for the recruitment, retention and growth of business in Orlando, the creation of jobs for our residents and the strengthening of our neighborhood commercial districts. Sherry began her career with the City of Orlando in 1994 starting as an intern and ultimately serving as the Mayors Business Assistance Team Director and Business Development Division Manager. In 2004, Sherry left the City of Orlando to pursue other opportunities and spend more time with her family. From 2004-2016, Sherry served as the Community Redevelopment Director for the city of Winter Park, as well as President of Gutch Partners, a business incentive, entitlement and strategic planning consulting company. Sherry holds a Masters of Public Administration from the University of Central Florida. Peter is a partner in the Orlando office specializing in taxation. With more than 23 years of professional experience providing tax, business and accounting compliance and advisory services, Peter has a strong general business background across multiple industries. He specializes in IRS representation, multi-state tax compliance, sales tax consulting, flow-through entities and works closely with private equity groups on mergers and acquisitions for corporate and business clients. A graduate of the University of Central Florida with a bachelor’s degree in accounting and a minor in computer science, Peter is a member of the American Institute of Certified Public Accountants (AICPA) and the Florida Institute of Certified Public Accountants (FICPA) and serves on the 2017-2018 UCF Real Estate Council. Jim practices in his firm's Real Estate Practice Group focusing on commercial finance and banking, condominium law, environmental and land use law, and mortgage and real estate law. Jim is a former member of the Winter Park Hospital Institutional Review Board and also served as Chairman of the BYU Alumni Association, Orlando, Florida Chapter. Jim is a former Bishop of the Maitland Ward of the Church of Jesus Christ of Latter-day Saints. He is the former President of the Orlando, Florida Stake of the Church of Jesus Christ of Latter-day Saints, where he acted as ecclesiastical leader of over 4,000 church members. From July 2015 to July 2018, Jim served as Mission President of the Canada Halifax Mission of the Church of Jesus Christ of Latter-day Saints. He had previously served a two-year mission for his church in France and Belgium. He also taught French at Brigham Young University speaks French fluently. Pratt has been named among the Best Lawyers in America, Florida Legal Elite and Orlando’s Top Lawyers. He is also an AV rated lawyer by Martindale-Hubbell. Mr. Callahan is the Managing Partner of Salerno Capital Partners, an opportunistic investment firm focused on providing capital (in the form of debt or equity) to businesses throughout the United States. Prior to joining Salerno Capital Partners, Mr. Callahan practiced law as a Partner with the law firm of Roetzel & Andress. Mr. Callahan concentrated his practice on representing banks, financial institutions, special servicers, private equity funds, real estate owners, investors and developers. He would often advise those clients on complex debt and operating structures in connection with their acquisition, ownership and sale of commercial properties located through-out the Eastern United States. This included counseling those clients on using securitized and mezzanine lending as well as preferred equity, as financing alternatives for their commercial real estate and multi-family properties. Mr. Callahan also has particular expertise in negotiating complicated purchase and sale agreements, loan documents, lease agreements and in creating successful strategies to assist his clients in accomplishing their legal and business objectives. Mr. Callahan also has significant experience in litigating defaulted commercial loans, contested foreclosures and in negotiating settlement agreements in those cases. With Mr. Callahan’s breadth of experience in law, debt and capital, he is a complement to the management team at Salerno Capital Partners. Mr. Callahan is a frequent speaker in the commercial real estate industry and the current chair-elect of CREFC’s Distressed Realty Assets Sub-Forum (HYDRA).